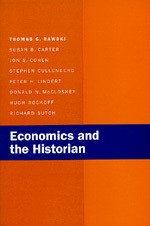 These essays provide a thorough introduction to economics for historians. The authors, all eminent scholars, show how to use economic thinking, economic models, and economic methods to enrich historical research. They examine such vital issues as long-term trends, institutions, labor—including an engaging dialogue between a labor historian and a labor economist—international affairs, and money and banking. Scholars and teachers of history will welcome this volume as an introduction and guide to economics, a springboard for their own research, and a lively and provocative source of collateral reading for students at every level. The combined research experience of these authors encompasses many varieties of economics and covers a kaleidoscopic array of nations, subjects, and time periods. All are expert in presenting the insights and complexities of economics to nonspecialist audiences. Thomas G. Rawski, the lead author, has written extensively on the economy of China. He is Professor of Economics and History at the University of Pittsburgh.